3pk Gator G6 Blade Bush Hog FTH ATH 720 Finish Rotary Mowers 88773. GRASSHOPPER: 320250, 320251, 320252, 320253, 320254, 320255, 320323. Fits Bush Hog 72'' Deck Models: ATH 720, FTH720. 3 Blades Required for 72'' Deck. 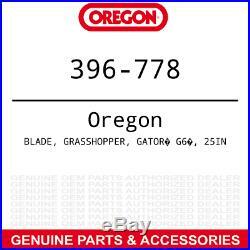 The item "3pk Gator G6 Blade Bush Hog FTH ATH 720 Finish Rotary Mowers 88773" is in sale since Thursday, March 21, 2019. This item is in the category "Home & Garden\Yard, Garden & Outdoor Living\Lawn Mowers\Lawn Mower Parts & Accessories". The seller is "fix_my_toys" and is located in New Baltimore, Michigan.